The Miracle Worker is a cathartic experience for me. Each time I watch the film, there’s a visceral reaction at the end when the truth is revealed to the young Helen Keller. The poignant innocence of the child, and the parents love for their strong-willed daughter is such a powerful and universal message. 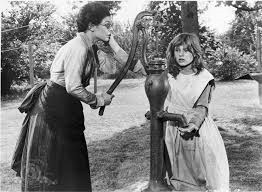 Yet it is the strong and silently steadying influence of the teacher, Anne Sullivan, portrayed with brilliance by Anne Bancroft, that gives this film the strength to inspire for generations to come. Pitting the will of the child against the powerful force of enlightenment is a metaphor that rings through in the building clash of wills between the two, the teacher and her unmanageable student. But the moment that brings tears to my eyes in each viewing is the moment of enlightenment. Knowledge means everything to Helen Keller, a brilliant human trapped in a body without the means to express herself. With the advent of the most illuminating of AH-HA! Moments in cinema, Bancroft and the young Patty Duke transfix the audience as we watch that most intimate and tender of moments when the teacher breaks through. As they gyrate in tandem with the hand signals that indicate water, the two artists perform the most beautiful dance imaginable. Art and knowledge triumph over darkness and ignorance in one graceful swipe of a gesture as the blind and deaf Helen Keller realizes the meaning of water, and the communicating symbol will open up a new world for her. The teacher, Anne Sullivan, truly becomes a worker of miracles.